In most cases, we don’t touch upon the obvious plays. There are other Start/Sit articles that will tell you to sit Patrick Mahomes because he has a tough matchup against Jacksonville. He has been a stud and you go down swinging with your studs until they aren’t studs anymore. He is 5-0 lifetime as a starter (with two of those games against the Broncos defense). Seriously, did you see him throw left-handed to keep the game-winning drive alive?!? We also don’t tell you to start Todd Gurley. That is obvious to anyone that follows football in any form. He is a stud Running Back that catches the ball out of the backfield, in perhaps, the most exciting offense in the NFL. We don’t list obvious plays so we can look like we are smart when the obvious plays do what obvious plays do. That doesn’t help you. We try to look at some of the plays that are questionable and give you insights on those. The “Red Rifle” never really gets a lot of respect as an elite Quarterback. Then again, that might be because he isn’t an elite Quarterback. But, he is definitely capable of putting up elite-level weeks. He is an overall Top-10 fantasy Quarterback after four weeks of the NFL season. 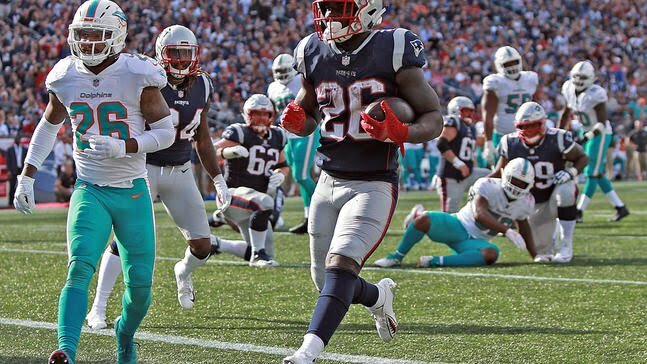 Dalton has thrown for more than 300 yards in each of his last two games and now gets a Dolphins team that may have started off 3-0 with an easy schedule but is coming off a thumping at the hands of the Patriots in Week 4. Miami is ranked 30th in the NFL in sack rate. Dalton should have plenty of time to find his receivers and pick apart this defense. Luck has had a nice return from injury this season as he has been a Top-12 fantasy quarterback and been putting up nice numbers despite the fact that he can’t throw deep anymore. However, he will be without his two best receiving weapons (T.Y. Hilton and Jack Doyle) on Thursday night. The Patriots are coming off of a Week 4 performance in which they made Ryan Tannehill look like, well … Ryan Tannehill. Seriously though, the Patriots are typically a bend but don’t break defense. They are okay with giving up yards just not touchdowns. However, they are always known for taking away the opponent’s best weapons. The 2018 version of the Andrew Luck-led Colts are a dink and dunk team. I anticipate that the Patriots will dare Luck to go deep and tighten up the middle of the field, minimizing the windows for him to throw short. The guy that Bill Belichick drafted when he already had 72 other Running Backs on the roster now seems to be healthy. Michel has increased his rushes from 10 to 14 to 25. That is positive progress, but it also correlates to the game’s outcome. New England was playing from behind in Michel’s first two games. Last week, they blew out Miami. They are huge 10-point favorites against the Colts on Thursday night. If you expect the game flow to be predictable then you’d expect Michel to get a lot of usage in the run game and have a chance at duplicating his Week 4 stat line of 25 rushes for 112 yards and a touchdown. I feel obligated to put the “obvious” disclaimer in here that Bill Belichick hates fantasy football and that it is always a scary thing to predict what he will do even when it seems “obvious”. Facts: McCoy is dealing with an injury. The Bills are bad (don’t let the upset of the decade in Week 3 vs. the Vikings fool you). McCoy has not played well. The Titans haven’t given up a touchdown to a Running Back all year. Yes, McCoy is still capable of a 100-yard, 2 touchdown performance but I like to deal in probabilities, not possibilities. Look elsewhere instead of crossing your fingers and hoping that he gets more than 9 PPR fantasy points and 13 touches in a game (which are both season highs for him). 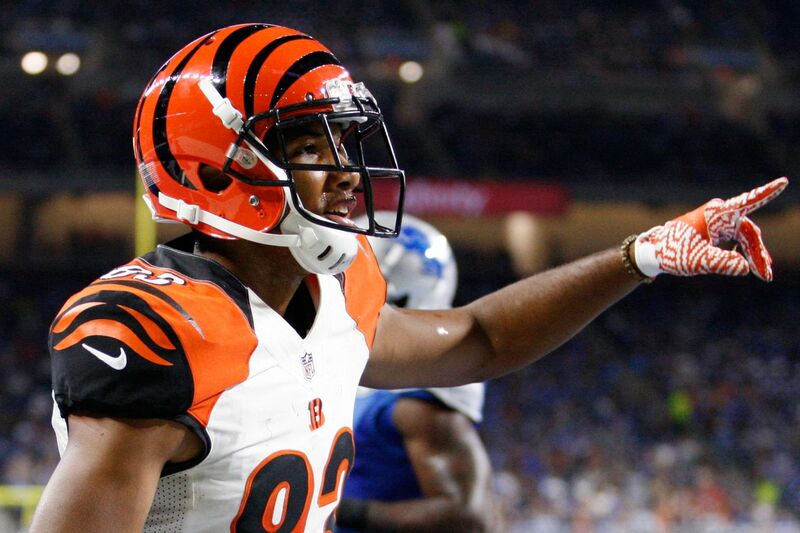 In case you haven’t been paying attention, Tyler Boyd is a solid WR2 and has had 21+ PPR fantasy points in three straight games. 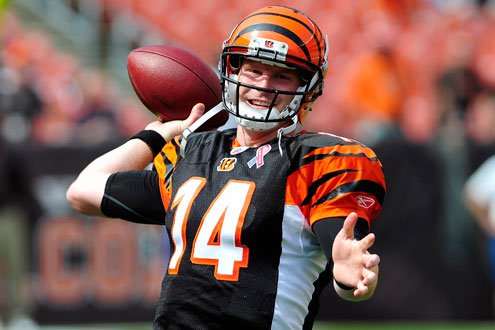 He is averaging 9 targets per game and has quietly become Andy Dalton’s security blanket. He even has two touchdowns this year. With the Dolphins a little banged up in the secondary, he will look to have his third straight 100+ receiving game. Tyler Eifert is out with a broken ankle, that should open up even more opportunities for Tyler Boyd in the middle of the field. He was a highly touted rookie two years ago that didn’t live up to the hype, but he certainly is making up for it in his third year. I have been an Enunwa truther since the preseason. He is one of my favorites and I have played him every week. However, his ceiling is not as high as I would like with rookie Sam Darnold at Quarterback. Enunwa has been wide open twice this year and Darnold has missed him. That means there is hope but it also means that they are not there yet. Enunwa only has 1 touchdown this year and that came in Week 1. Enunwa has a solid floor but I just don’t see him being a top-30 receiver this week. He lines up against a great slot defender in Chris Harris of the Broncos this week. After having 10 and 11 targets the first two weeks, he has 8 the last two weeks. That isn’t huge but it is enough in a game projected to be low-scoring to cause some concern. Last week I said not to start him because it is hard to know what is going on with this Steeler’s pass game when it comes to the Tight End. There is still no certainty but after Week 4’s game against the Ravens, it appears that McDonald is locked in to a fairly consistent amount of targets. 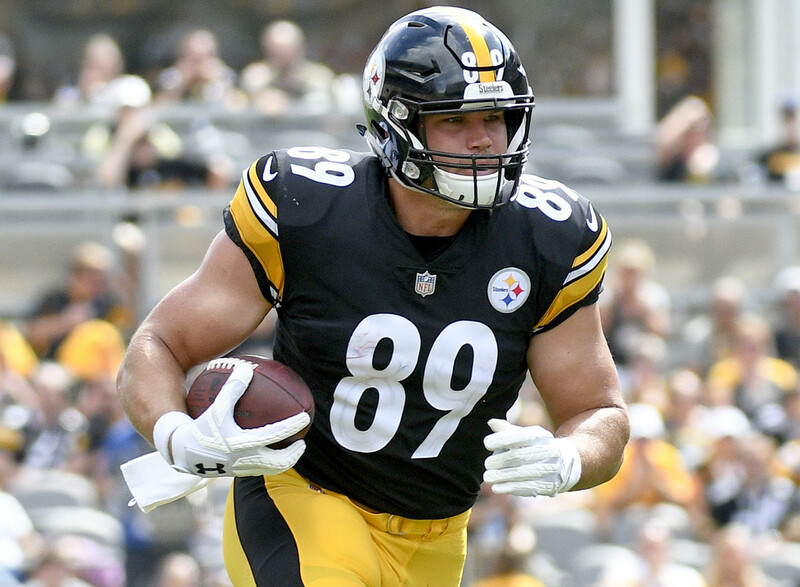 It is not a large amount of volume as he has seen 5 targets in each of the three games he has played in this season, but it is consistent (by comparison, Jesse James only had 1 target for the second straight week). As much of a beast as he is, there is always the chance that he can turn some of those targets into a big gain. He is a borderline start for me, but with the opponent being the very depleted Atlanta Falcons in the week’s highest scoring projected game, then I would elevate him to a confident start. There will be a lot of scoring in this game. In the Week 3 shootout with Tampa Bay, McDonald had a stat line of 4-112-1. He has a great chance of putting up a big stat line this weekend – unless, of course it is Jesse James’ turn. This isn’t so much for you as it is for me. I am a sucker for Ben Watson. I play him often and he is on a lot of my teams. Don’t play Watson this week. Don’t play Watson this week. Don’t play Watson this week. I should write that 100 times on a chalkboard. But I like this Saints offense and he has been sneaky good for so long. He is also a good character guy – not that it should matter for fantasy football but I just can’t get away from him. I am probably not the only one that plays Watson sometimes because if you are serious about the NFL (which you are or else you wouldn’t be reading this on CouchPotatoGM) then you know that he is third on this Saints team in receptions and receiving yards (behind Alvin Kamara and Michael Thomas). If you didn’t know that stat, then you might be shaking your head up and down like I am right now contemplating playing him so that you can get some of that Saints offense. But don’t play Watson! He is touchdown dependent and hasn’t caught a touchdown all season. With Mark Ingram coming back this week, that really confuses things and probably leads to less red-zone opportunities for Watson. Please, Jamy, don’t play Ben Watson – even though he is one of your favorites. Unless you have one of the top 4-5 defenses that are probably an automatic start each week, then you might want to consider streaming your defense each week with the team with the best matchup that is at home. Remember, low scoring games is not the only factor for a good defense. You can’t predict fantasy defensive scoring, but you can predict opportunity. You want defenses that are aggressive and get pressure on the quarterback. This pressure can lead to turnovers. It is also a decent gamble to target defenses going against rookie or inexperienced quarterbacks. Here are three teams that you might want to consider streaming for this week, along with three teams you’ll want to be a little cautious with. Related Items#CPGMFantasyFootball2018 Fantasy Football2018 Fantasy Football Lineup2018 Fantasy Football Start/SitFeaturedSitStartStart and SitStart Em Sit EmStart SitStart Sit DecisionsWeek 5 Fantasy Lineup DecisionsWeek 5 Start/Sit 2018Weekly Fantasy LineupWho should I start in Fantasy Football?Who should I start in Week 5 Fantasy?